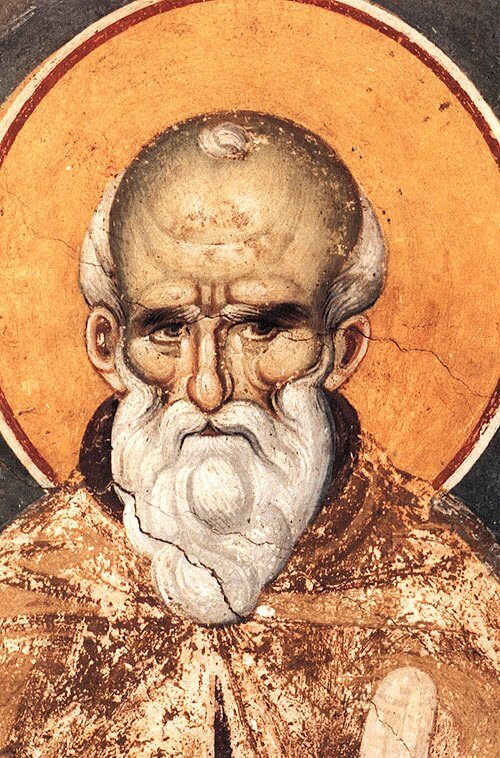 St. Maximus the Confessor (ca. 580-662) is one of the most important Churchfathers of the East, best known for its mystical and ascetical writings, and a defender of the Orthodoxy against the heresy of monothelitism. His title of Confessor (in Greek also martyros) means that he suffered for the Christian faith, but he was not directly martyred. St. Maximus (580-662) was born in Constantinople, in a noble family and had a good education. The maronite source, who share the monothelite teaching, ascertain that he was from Palestine. About 610 Maximus he became the personal secretary of the Emperor Heraclius (610-641), but from unknown reasons, after three years has left that position and entered in the monastery of Chrysopolis, situated on the other shore of the Bosphorus Straight, taking the monastical vows. Shortly after he became the abbot of the monastery, and from this position he used to say that the theology without practice is a theology of demons, so his theoretical approach to the theology was doubled to a practical one. At the Persian invasion from 632, he was obliged to flee together with his entire community, so that he arrived in the Province of Africa, at that time under the Byzantine rule, together with his friend the monk Sophronius, the future patriarch of Jerusalem. Here he remained in a monastery near Carthago, where he studied the christological writings of Gregory of Nazianzus and Dionysius the Areopagite. In Africa, Maximus and Sophronius began their fight against the official position of the emperor, who found the monothelite solution as the one to re-unite the schismatic miaphysites (or monophysites) from Egypt and Syria with the orthodox believers from Constantinople. The miaphysites (the ancestors of the today Coptic believers from Egypt) believed that in Christ there is only one nature - the divine one - , because the human nature disappeared into the divine, such as a drop of water disappears into the ocean. In order to reestablish not only the religious union, but especially the political one, in danger of Persian and Arabic invasion, Emperor Heraclius in agreement with the Patriarch Sergius of Constantinople (610-638) imposed through an official decree the doctrine of monothelism as the official position of the Church. The new doctrine stated that in Christ there are two natures, divine and human, but only one will (mono-thelos) and one work (mono-erga), which in fact was a hidden form monophysitism. The official declaration became as a formal pact between the Orthodox and Monophysite parts in 633. The first to see the danger of this “compromise” and to fight against it was in fact the monk Sophronius, even before this compromise to be signed. Shortly after, he became Patriarch of Jerusalem, and from this position he published a synodal letter (643), in which he makes a clear distinction between the two works in Christ. In the next four years nothing special happened, but the troubles began in 638, when the Emperor Heraclius published the so-called Ekthesis, the official imperial “Confession of faith”. Shortly St. Maximus became the leader of the struggle against the heresy. Between 642-645 he carried out an extensive work to strengthen the African bishops against the imperial heresy there. In July 645 Maximus carried in Carthage a great public dispute with Pyrrhus, in the presence of many bishops. Pyrrhus was the former patriarch of Constantinople (638-641 and later in 654), and a monothelite, but in the same time an old friend of Maximus. After these debates Pyrrhus agreed that the monothelite position is false and heretic. Several councils in Africa condemned shortly after the Monothelism as heresy. At the end of 646 St. Maximus went to Rome, where he remained up to 649. Here the pope Martin (649-653) convened the Council of Lateran (649) in presence of 105 bishops, who also condemned the Monothelitism. But a terrible situation happened in that time, because the central Italy fell into the Byzantine control and in 648 the Emperor Constantine II (641-668), successor of Heraclius gave a new decree, which stopped under heavy penalty any discussion about the fact that in Christ there are one or two works and willings. In 653, St. Maximus and St. Martin of Rome were arrested and brought to Constantinople. St. Martin, condemned without trial, died on the way, but Maximus came in front of the tribunal, where he was sentenced in 655 with the exile in Bizya, a town in Thrace. A new hearing in the same year sent him in Perberis, at the Black Sea’s shore. Later in 662, St. Maximus was brought to Constantinople for another hearing, in order to be forced to accept the monothelite teaching. Here in front of the crowd, the soldiers have cut his right hand and the tongue, in order to make him unable to communicate his position neither through speech nor in writing. After this barbaric mutilation, which happened when St. Maximus the Confessor was already about 80 years old, he was sent into exile in Lazika, situated on the eastern coast of the Black Sea, being cast in the fortress of Schemarum, probably near the modern Georgian town of Tsageri where he remained until the end of his life, which happened in the same year, on August 13, after a great sufferance, at the venerable age of 82 years. The events of the trials of Maximus were recorded by Anastasius Bibliothecarius (Migne, Patrologia Latina, vol. 128 (Historiae de vitis Romanorum pontificum, 130, col. 737-763). Along with Pope Martin, Maximus was rehabilitated by the Sixth Ecumenical Council (680–681), which declared that Christ possessed both a human and a divine will. With this declaration, the Monothelism became heresy, and Maximus was posthumously declared innocent of all charges against him. His feast day is in the Eastern Church on August 13 (the moving of his relics) and on 21 January. In the Western Church he is celebrated on August 13. The orthodox Synaxarion from the Menologion attests that after Saint Maximus’s death, on his tomb occured healing miracles, and that three bright lights like candlesticks could have been seen burning (a symbol of the Holy Trinity). In the Greek Prologue, August 13 commemorates the Transfer of the Relics of St Maximos from Lazika on the southeast shore of the Black Sea to Constantinople, to the Monastery of the Theotokos at Chrysopolis (where he had been the Abbott), across the Bosphoros which probably took place after the Sixth Ecumenical Council. August 13 is considered by many scholars als the saint’s death. It is possible that his main commemoration was moved to January 21, because August 13 is the Leavetaking (the End) of the Feast of the Transfiguration of the Lord. 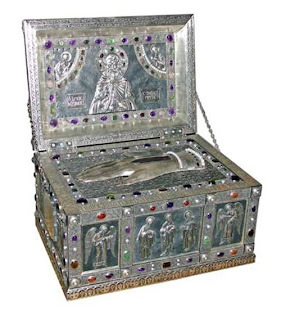 Today a part of his Relics is to be found in Mount Athos, at the St. Paul’s Monastery (a reliquary with the right hand of the Saint, the one to be cut after the trial from 662). This relic was brought here from Constantinople in the 12th century by the Abbot Paul from Xiropotamou. This is the only relic known of the saint. Anyway, some international journals stated that the rest of the Relics of St. Maximus (matter fact his tomb) were discovered in Georgia, near Tsangeri, in October 2011. 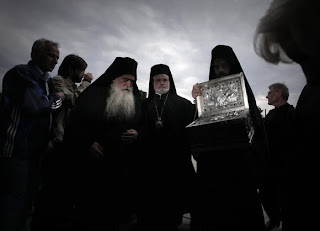 The arguments of the discoverers can be believed, because in fact there are no historical informations about the real moving of the relics, but only liturgical sources. His tomb was found under the altar of a church in Tsangeri, who’s patron saint is even St. Maximus, together with the remains of the 3 apprentices of the saint. From St. Maximus have remained numerous writings, some of which were included in the Greek Philokalia, an important collection of mystical writings for the Eastern Christianity. Some of these writings are dogmatic, but curiously St. Maximus is known not because of his dogmatic writings about the Person and Nature of Christ, but because of the ones in which he described the contemplative life, providing an ample guidance to the ascetics. Some other works were written on the liturgical and hermeneutical themes. As a follower of the Areopagite, Maximus preserved and interpreted the earlier neo-Platonic philosophy in a Christian way. His work on the Areopagite was continued in the West by John Scotus Erigena. The Platonic influence on Maximus' thought can be seen most clearly in his anthropology. Maximus adopted the idea that the humanity was made in the image of God, and the purpose of the salvation is to restore us to unity with God. In soteriology, Maximus insisted that the humanity is intended to be fully united with God, because God was first fully united with the humanity in the incarnation (such also St. Athanasius of Alexandria told before). If Christ did not become fully human, then salvation was no longer possible, as humanity could not become fully divine. That’s why he condemned so strongly the monothelism, the heresy who denied the human will in Christ. The accent on the idea of the human divinization or theosis made Maximus one of the most important Eastern theologians. Ignored for centuries by the Western scholars, the writings of St. Maximus had always a special place in the Eastern theology. 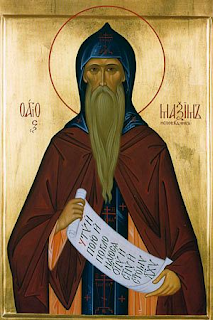 He is considered to be the “spiritual father” of some mystics as St. Symeon the New Theologian and Gregory Palamas. - The Life of the Holy Virgin - the earliest complete biography of the Virgin Mary, with interesting connections to the apocryphal gospels.